It’s a clear trend — some of Narendra Modi’s cabinet ministers have enthusiastically retweeted him, pushed out positive news articles about him, and even eulogised him. 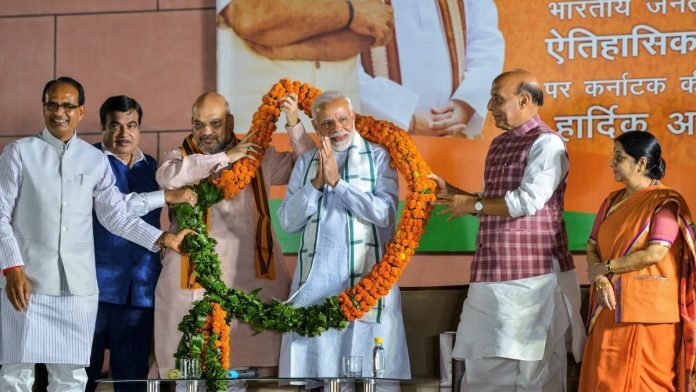 New Delhi: Prime Minister Narendra Modi, who was voted to power with a powerful mandate in 2014, has received lots of brickbats and bouquets in his time as head of government. But some of his cabinet colleagues have eulogised him with reverential descriptors on Twitter — from the “messiah of the poor” to an “inspiring leader”, from someone whose is as “pure” as the Ganga to a “global phenomenon”. The PM has been an ardent user of social media and has urged all his cabinet members, besides other party leaders, to be active on various platforms, particularly Twitter. And for most of his cabinet colleagues, Twitter has ended up becoming a useful tool to heap praises on their leader. A look back through the tweets of current and former cabinet ministers over the years shows a dominant trend — enthusiastic retweeting of the PM’s important tweets, pushing out positive news articles about him, and more importantly, a more-than-generous dose of praise for Modi and his achievements. M. Venkaiah Naidu held several portfolios in this government — from parliamentary affairs to housing and urban poverty alleviation, urban development, and even information and broadcasting — before becoming Vice-President of India in August 2017 after defeating opposition candidate Gopalkrishna Gandhi. Naidu, known for his colourful use of language, was one of the most enthusiastic and no-holds-barred cabinet ministers when it came to praising Modi on Twitter. Consider the following: “PM @narendramodi has lived up to the expectations of the nation and proved that he is real messiah of poor. #IndiaWithPMModi,” he tweeted in December 2016, a month after the Modi government brought in demonetisation. In March 2017, Naidu displayed his now-famous love for acronyms. “Mood Of Developing India (MODI) is for Making Of Developed India (MODI) under leadership of PM MODI, seen as only hope of aspiring India,” he tweeted. On the death anniversary of former President A.P.J. Abdul Kalam, Naidu claimed it was Modi who was building the India of Kalam’s dreams. “The dream of Dr #AbdulKalam is now being pursued by our Prime Minister Shri @narendramodi who’s on a mission of Making of Developed India,” his tweet on 27 July 2017 read. Naidu even credited the PM for some of his own initiatives. “Inspired by PM @narendramodi’s “Minimum Government, Maximum Governance”, I had proposed merger of @Moud_India and @MoHUPA,” a tweet said. In fact, after being elected Vice-President, as Naidu thanked those who went to greet him, he reserved the extra warmth for Modi. “I am overwhelmed by the warm wishes of PM Sri @narendramodi at my residence today,” he tweeted with a picture of both of them. Since then, of course, Naidu as Vice-President has been far more restrained in this respect. Ravi Shankar Prasad has also held multiple important portfolios in this government — communications, law and justice, and electronics and information technology. Fairly lavish with his praise for the PM, Prasad at a press conference once drew an analogy between the “purity” of Modi and the river Ganga. He, however, did not quite stop there and decided to push out a tweet as well. “Questioning the honesty of our PM is like questioning the purity of our Maa Ganga,people of India has full faith on both Maa Ganga & PM Modi,” he tweeted in December 2016, along with a short video clip of his press meet. In October last year, after Modi addressed a townhall with professionals, Prasad decided to push out a video clip of the audience applauding the PM. “Hear it out what India’s industry leader @anandmahindra said about Prime Minister @narendramodi that everyone started clapping during the Townhall event on the launch of #Self4Society,” he tweeted. His cabinet colleague Prakash Javadekar — who started off as a Minister of State, and went on to become an MoS with Independent Charge before being bumped up to cabinet rank with the plum Human Resource Development portfolio in mid-2016 — has been full of praise for the PM too. In January this year alone, Javadekar posted enough such tweets. “Thank you Honourable PM @narendramodi for your wishes. I rededicate myself to the service of our country under your inspiring leadership,” he wrote, as Modi wished him on his birthday. The minister even drew a binary — Modi or anarchy. “The issues which are most important in the coming #LokSabha elections are whether people want Majboot Sarkar or Majboor Sarkar. Whether People want @narendramodi or Anarchy,” he tweeted, along with a clip of his press conference. In September 2017, on the occasion of Teachers’ Day, Javadekar tweeted an image of former President Sarvapalli Radhakrishnan — in whose memory the day is celebrated. “Taking cue from PM @narendramodi ‘Mann Ki Baat’, let’s resolve to ‘Teach to transform, Educate to Empower, Learn to Lead’ on #TeachersDay,” the accompanying tweet read, giving credit to the PM’s radio programme. Some of Modi’s ministers have even gone on to hail him as a “global phenomenon”. “All our former PMs are respected & received very well. But it’s also a fact that Modi ji is a phenomenon all over the world,” Minister of State for Home Kiren Rijiju tweeted in June 2017, along with a video clip of Modi arriving on a foreign visit. “Congratulations to PM @narendramodi ji for receiving first-ever Philip Kotler Presidential award. It is a matter of great pride for India that the award focusing on triple bottom-line of People, Profit & Planet is conferred to our PM for outstanding leadership & selfless service,” textile minister Smriti Irani tweeted last month. Not everybody has had an upward trajectory in the Modi cabinet, but that hasn’t quite stopped them from using Twitter to praise the PM. Irani herself has had a chequered journey as minister in this government — being given the prestigious HRD ministry as the government came to power, being banished to textiles after a controversial tenure, then rehabilitated as Minister of Information and Broadcasting, but eventually being dropped from that as well. Irani, however, has been open about her admiration for the PM. “Vijay Mallya’s extradition is yet another victory for PM @narendramodi ji’s untiring efforts towards combating corruption & undoing the wrongs of the past. Grateful to Hon PM for fulfilling one more promise made to the Nation. #ModiGetsMallya,” she tweeted in December last year. In January 2018, she even sought to connect the launch of 28 satellites by six countries to the PM. “28 satellites from 6 Nations carried by today’s launch are a testimony to not only our philosophy of ‘Vasudhaiva Kutumbakam’ but also compliments Hon PM @narendramodi ji’s endeavour of ‘Sabka Saath, Sabka Vikas’,” her tweet read. In October 2017, Irani tweeted saying Modi had “restored the faith of citizens of Pipri village in participative democracy”. Veteran leaders Kalraj Mishra from UP and Rajiv Pratap Rudy from Bihar were among those made to resign as ministers in August 2017 before a reshuffle. In January this year, a month after he was appointed national spokesperson, Rudy tweeted: “Scaling new heights of development under the leadership of Hon’ble Prime Minister Shri @narendramodi ji. #NewIndia #SabkaSaathSabkaVikas @BJ4India. Non Stop India. via NaMo App,” along with a short video clip. Mishra, meanwhile, mostly tweets positive news articles and reports on the PM. A concerted effort by Modi’s ministers has been to project him as a trusted leader, a much-loved leader, with special emphasis on giving him a human face. “PM @narendramodi ji historic address in Parliament is a testament to the faith instilled in his leadership by the people of this Nation 4 years ago. #IndiaTrustsModi,” Irani tweeted in July 2018. In December 2016, she quoted a news report of the PM serving food at the Golden Temple. “Narendra Modi becomes first PM to serve ‘langar’ at Golden Temple,” she tweeted, accompanied by a link to a news story. In July 2017, just before being elected Vice-President, Naidu also sought to portray Modi’s leadership as “trustworthy”. “Great news to fellow Indians. PM @narendramodi tops with 73% in the world for trustworthy leadership,” he tweeted, along with a link to a news story. This came just months after he posted a tweet claiming the PM’s letter had “ensured education to Muslim girl in Karnataka”. Rijiju, meanwhile, invests his energy in portraying Modi as a much-loved leader in the Northeast. “How @narendramodi ji has won the hearts of the people of North-East India? A small clip of my reply to the Private Member Constitutional Amendment Bill in Lok Sabha today,” he tweeted at the end of last year. “A Prime Minister who loves, cares & treasures the deep rooted patriotism of the people of Arunachal Pradesh. @narendramodi ji has alleviated the sense of neglect in the minds of the people,” a tweet by Rijiju in February 2018 read. Mishra, meanwhile, shared a story about “An Adorable Photo With His ‘Young Friends’ From His Trip To Varanasi” in September 2018. Not to be left behind is Rajyavardhan Rathore, MoS (Independent Charge) for Information, Broadcasting and Sports. “How a 9-year-old Narendra Modi opened a food stall to help Gujarat flood victims: Lesser-known facts from PM @narendramodi ji’s childhood,” Rathore tweeted with a news report early last month. Then again, in May 2017, the minister shared a news story about how “in a heartwarming gesture, PM @narendramodi ji breaks the protocol for Jawan’s child in Kedarnath”. Besides flowery praises and bountiful compliments, Modi’s cabinet ministers also use Twitter to share various positive news reports about him, particularly those picked by the PM’s own app. From reports praising demonetisation to the Organisation for Economic Co-operation and Development’s economic outlook report, the leap in Ease of Doing Business rankings, Modi building a “stronger” India, putting an end to the “policy paralysis” seen in the UPA regime, emerging as the “most mentioned personality on Twitter” and to his very “positive” personality traits, cabinet ministers leave no stone unturned in showing adulation for their “visionary” leader on Twitter. The ministers have succeeded in using the social media platform to the hilt, and for some of them, it has been an indispensable medium to express their adulation for him. It is looking absurd because responsible ministers are saying so for Modi but no one is coming out in favour of Pappu. Senior leaders in Congress are for most of the time avoiding their views on RaGa. Most ridiculous is Ravi Shankar Prasad. He calls Modi ji pure like Ganga in this tweet; he’s the one who looks most angry while chastising Rahul Gandhi on TV when the latter has called Modi ji a “chor”, which is happening more and more often now. But all this is nothing — I have actually see Ravi Shankar crying, wet and red eyed, while his messiah was delivering one of his nasal speeches. People used to cry while listening to Hitler, I have read somewhere. (I wonder how Ravi Shankar will react when one of these days Modi ji delivers his most passionate speech ever to declare cancellation of the Rafale deal).